Form teams of two players each (max of 5 teams). Each team meets privately to come up with a non vocal signal to indicate when either teammate collects 4 of the same Crab Card. Each player will get a hand of 4 cards. One side plays at a time. On a side’s turn, all players on that side can simultaneously swap any card from their hand with a card from the middle of the table (The Ocean). When you have 4 of the same Crab Card, you can't say anything out loud. Instead, when you’re ready, give your secret signal to your teammate. 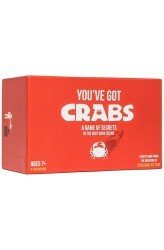 When they notice, they will point at you and shout, 'YOU’VE GOT CRABS!' If they’re right, your team gets a point. If they’re wrong, your team loses a point. However if a player on another team suspects you’re passing a signal, they can point and sh.. 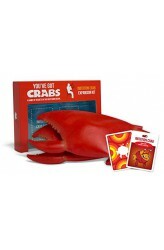 Create an advantage for your team, look like a crab doing it 1 Powerful Expansion Card 2 Wearable Crab Claws ..